Unless alloyed with a very small quantity of some other metal, both Gold and silver are too soft to withstand wear and tear while being adorned. It is very easy to carry out adulteration of an alloy into the precious metal without change in its color or touch and is difficult to detect without technical tests. Therefore hallmarking is the accurate determination and official recording of the proportionate content of precious metal in Gold and silver. Hallmarks are thus official marks used in many countries as a guarantee of the purity of fineness of gold jewelry (BIS). CE certified Markolaser Minnie Series is a compact yet extremely rugged and powerful set of machines.Each machine type has some typical features. For example GP +Plus model has normal properties of marking and limited engraving functions. 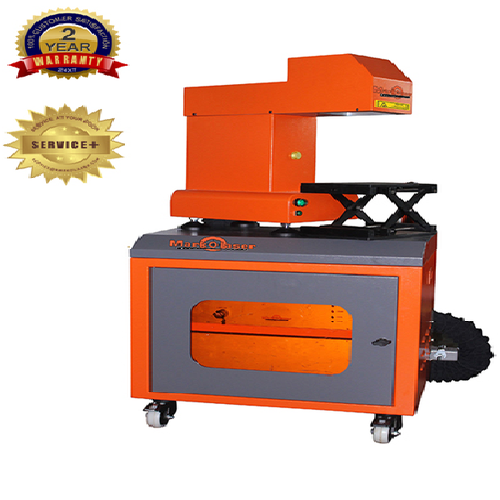 Micro are fine series of machines with extremely thin yet powerful beam for micro marking, micro engraving and micro drilling applications. (DE+HF) are one of the world's finest deep engraving machines. We are very proud of this machine being a workhorse in deep engraving business. In combination with our advance features and extensive research each machine is further customised after carefully analysing our clients applications. G +Plus 20W is General Purpose machine with additional features of color marking, limited deep after carefully analysing our clients applications. engraving and is a workhorse in tough Industrial conditions. * +100,000 Hours of expected laser lifetime. * Automation integration options and x-y cross table offers infinite possibilities. * Low energy consumption does away with high energy costs incurred with traditional lasers. * Compact rugged air cooled design. * Red pointer for mark preview. * Optional suction system for longer life and quality. * High speed, versatile & user friendly. * Excellent after sales service by a highly qualified & experienced techincal support team. * Zero consumables & negligible maintenance ensures low cost of ownership. Spinks India is one of the leaders amongst suppliers, trader, exporters & manufacturer of pad printing machines. In due course of time, the company has developed a wholesale distribution network and instituted strategic tie-ups with world's well known companies in the field of printing for the sale of their products in India. Providing the customers with complete service and technical know-how has been the hallmark of Spinks India's strategy.